The Hawkeyes Mic picks are in for the Iowa – Minnesota game. And when you’re talking the Hawkeyes-Gophers – these aren’t mere prognostications but Hognostications. It’s not only unanimous but the projected scores are pretty close this week in the annual battle for the Bronze Hog. Thanks to our guest picker John Bohnenkamp of The Hawkeye in Burlington. Check them out – see if you agree or disagree. Two things are at play here — a.) the Hawkeyes always seem flat after a bye week and b.) the recent games against the Gophers have been close. Kirk Ferentz talked this week about feeling good about how his team has been working in practice, so maybe the Hawkeyes won’t be flat. Even if they are, the defense should be able to limit the Gophers. After a disappointing loss, playing a rivalry game on the road could have its challenges. However, for Iowa, I think it galvanizes the players and puts them in the right frame of mind for facing border pal Minnesota. Iowa is better in just about every position group, save for wide receiver, and this is where the team gets back on the right track. The Hawkeyes have historically been slow coming out of bye weeks, but Iowa’s defensive line has a chance to dictate an even slower start by Minnesota and its group of young talent at the skill positions in this year’s battle for the bacon. Maryland rushed for 315 yards against the Gophers in Minnesota’s most recent game and there is no reason to believe that Ivory Kelly-Martin, Toren Young and Mekhi Sargent can’t enjoy similar success in Iowa’s first road test of the season. Iowa needs a response to the loss to Wisconsin they’ve been stewing over for a full two weeks now. Minnesota, with a young Quarterback and defense which was just obliterated by Maryland last weekend should be the best recipe to get back on track. Many may pick this game closer because it’s a rivalry game on the road, but I see Iowa winning every battle, Nate Stanley having a monster game, and the defense vying for a potential shutout late in this one. The Hawkeyes will be bringing home the bacon, back on track in the B1G West. The Hawkeyes are 9-0 since the start of last season when scoring 20 points or more. Minnesota’s defensive stats aren’t bad, but they’re made nicer by the Gophers’ soft schedule thus far. Plus, Minnesota allowed 42 points against Maryland in its last game. Look for Iowa to win its fourth-straight over rival Minnesota. Special Teams appear to be a wash – but both offensively and defensively this would appear to be a mis-match on paper as well as on the field. Minnesota is very young and has lost its two best players (one each on the Offense and Defense) for the season due to injuries – and it’s starting QB is a true freshman walk-on. All of that is not a recipe for success against this Iowa Team. I expect the Hawkeyes to dominate – which is unusual for a Ferentz-coached team coming off its bye week. 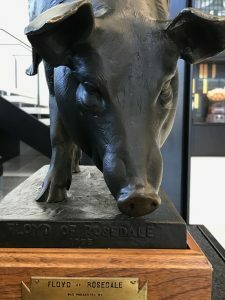 Floyd really enjoys living in Iowa City – which after this one is over he will be doing so for the fourth year in a row. Hawkeyes Mic Hawkeyes-Gophers Content and Coverage is here.